This summer CSNTM sent a team to the East Coast to digitally preserve Greek New Testament manuscripts at four different sites. This was our first trip to the East Coast to photograph manuscripts. Drew University in Madison, New Jersey, boasts of six such manuscripts; Trinity College, Connecticut, has two; the Museum of Biblical Art in New York City has one. And the New York Public Library, perhaps the greatest city library on earth, has three. I’d like to tell you a bit about this last site. Please click above to be taken to Amazon's website. A portion of every purchase you make will automatically be given to CSNTM. There are no higher fees, used and third party items count, and you may still utilize your prime account! This is an effortless way to support CSNTM's mission. Simply follow these links to the Amazon's homepage , and CSNTM will automatically be given a portion of your purchase. 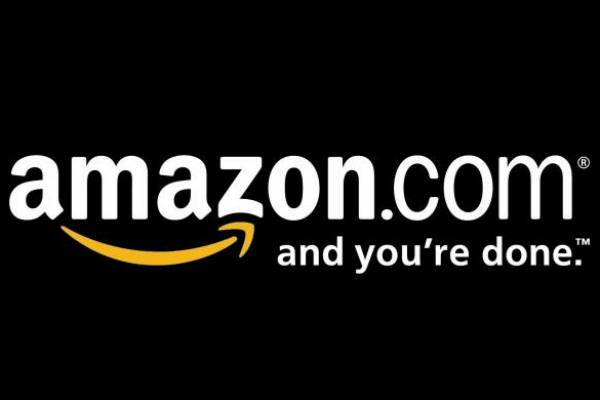 Also, remember anything and everything that can be purchased on Amazon will still qualify for this promotion. This is an effortless way to support CSNTM's mission. Just remember that you must click on the above picture for each purchase you make. CSNTM thanks you for your support! A graduate of Princeton University in the early nineteenth century, Robert Garrett, acquired a medieval copy of Paul’s letters, Hebrews, Acts, and the Catholic letters from Mt. Athos in 1830. His estate later donated this manuscript to Princeton University. The manuscript was produced in the twelfth or thirteenth century on parchment. It was meant as something of a pocket Bible, measuring only 13.9 x 10.3 centimeters. The leaves are very fine vellum, extraordinarily thin. Housed in the Special Collections room of the Princeton University’s Firestone Library with the shelf number Garrett 8, it had only briefly been mentioned in works dealing with New Testament manuscripts. According to J. K. Elliott’s Bibliography of New Testament Manuscripts, 2nd edition (Cambridge, 2005), the latest published discussions of this manuscript was in Kenneth W. Clark’s Eight American Praxapostoloi in 1941. I examined the manuscript on Thursday, 16 August 2012 for about an hour. It is true that the manuscript has been burned. It is also true that many of the leaves stick together, most likely from the heat melting the ink. But it is still completely intact. It needs to be restored, but it is not gone forever—not by a long shot. In fact, it is mentioned in some detail in Greek Manuscripts at Princeton: Sixth to Nineteenth Century, by Sofia Kotzabassi and Nancy Patterson Ševčenko, with the collaboration of Don Skemer (Princeton University Press, 2010). Mr. Skemer in fact wrote to me and said he had no idea why anyone would ever think the manuscript had been destroyed. I am grateful to Mr. Skemer, the Curator of Manuscripts at the Firestone Library, and his assistant, Charles Greene, for granting us access to this and other manuscripts in the Special Collection. And I am thrilled that a presumably dead manuscript has come back to life! The CSNTM staff has been working very hard to select some of the very best books for studying the New Testament. The initial listing is now posted at our brand new “New Testament Resources Store” under the resources tab. These books belong to fifteen categories, which cover the basics. These include Textual Criticism (of course! ), Historical and Literary Backgrounds, Hermeneutics, NT Greek, Commentaries, and many more. We have not listed any junk here. All these books are worth owning, though some are advanced treatments and may not be suitable for you. If you have doubts about the appropriateness of certain books for your own library, just email us, and one of us will get back to you. We are making it very easy for you to purchase these books. When you visit the NT Resources Store, click on a category and find the book that interest you. This will take you to a description page and offer a button to make a purchase at the Amazon store. You get the same terrific prices as you normally would at Amazon (they will know who you are if you’re a returning customer), including the free shipping for Amazon Prime members. And your purchase helps CSNTM as well since Amazon gives the Center a portion of all sales through our website. The more books you buy, the more expeditions we can go on to photograph manuscripts. We’ve already been told that some folks plan to use the CSNTM gateway to Amazon from now on for everything they buy there. We are making it very easy for you to purchase these books. When you visit the NT Resources Store, click on a category and find the book that interest you. This will take you to a description page and offer a button to make a purchase at the Amazon store. You get the same terrific prices as you normally would at Amazon (they will know who you are if you’re a returning customer), including the free shipping for Amazon Prime members. And your purchase helps CSNTM as well since Amazon gives the Center a portion of all sales through our website. The more books you buy, the more expeditions we can go on to photograph manuscripts. We’ve already been told that some folks plan to use the CSNTM gateway to Amazon from now on for everything they buy there. CSNTM is grateful for your support. Happy hunting! With a lengthy beard and ponytail to match, Father Justin easily stands out in a crowd. After hearing about his journey that led him into becoming a Greek Orthodox priest and eventually to St. Catherine’s Monastery on Mt. Sinai, Egypt, one becomes convinced of the uniqueness of this priest. Born in El Paso, TX into a Baptist home, Father Justin later discovered the world of Greek Orthodoxy in college at the University of Texas. After serving twenty years at a monastery in Brookline, MA, he became the first non-Greek to live in St. Catherine’s Monastery. As he put it, he “just showed up hoping they would allow me to stay”! After serving faithfully at Mt. Sinai for many years, Father Justin was recently appointed the position of librarian at the monastery. It is due to this recent appointment as the librarian that the Center for the Study of New Testament Manuscripts (CSNTM) gained the privilege of hosting Father Justin for two days in November. Father Justin’s duties at the library include photographing the 1,200 manuscripts that were discovered in 1975 in a hidden compartment at the monastery. This number increased St. Catherine’s holdings to 3,300, making its collection of ancient manuscripts the second largest in the world, behind only the Vatican. Due to the large costs that inevitably arise when setting out to digitally preserve manuscripts, Father Justin has been touring the country aiming to raise funds for this great endeavor. Consequently, CSNTM jumped at the opportunity to partner with Father Justin and St. Catherine’s, and on November 8–9 Father Justin shared about the past, present, and future work concerning the texts housed at St. Catherine’s at the Center’s headquarters in Plano, TX. Attendees were both entertained and encouraged by the work already taking place at Mt. Sinai. Among the 3,300 manuscripts housed at St. Catherine’s Monastery, the most important and well known is Codex Sinaiticus—the oldest complete New Testament in existence. The history of this manuscript is wrought with mystery, politics, and perhaps even some deception as the bulk of it was taken from the monastery in the mid-1800s. With this codex, along with the thousands of others, it becomes difficult to overestimate the value of St. Catherine’s Monastery to textual research. The humility and reverence Father Justin practices in his efforts to preserve the ancient texts are admirable to say the least. 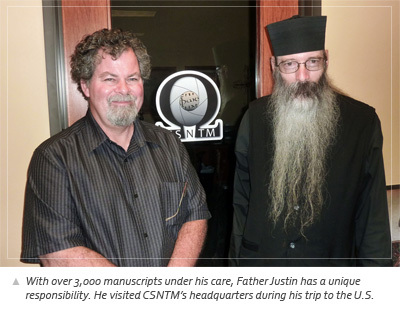 Therefore, it is with great enthusiasm and honor that CSNTM hopes to continue to partner with Father Justin and St. Catherine’s Monastery in the work of digitally preserving the text of the New Testament.